James Percy Ault was born in Olathe, Kansas in 1881. He received an A.B. at Baker University in 1904. During his time at Baker Ault served as observatory assistant in the magnetic observatory of the United States Coast and Geodetic Survey. After his graduation in 1904 Ault joined the Carnegie Institution of Washington (CIW) as a magnetic observer with the Department of Terrestrial Magnetism (DTM). He remained an employee of the Carnegie Institution for the rest of his life. In 1905, after a short training period, Ault joined the crew of the Galilee, a sailing vessel chartered by Carnegie to undertake magnetic research around the globe. Ault remained on the Galilee until November 1906. 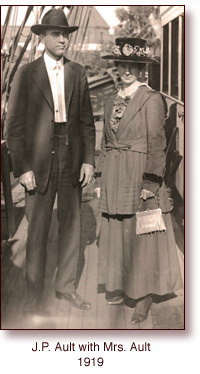 He then made magnetic observations in Northern Mexico until March 1907, when he married Mamie Totten. After marriage, the Aults moved to Washington, D.C. where they remained until Ault's death. In 1908 Ault made a three month canoe trip in the Canadian interior to make magnetic observations. In 1909 Ault received an A.M. degree from Columbia University. Later in the same year he joined the crew of the newly-commissioned research vessel Carnegie. 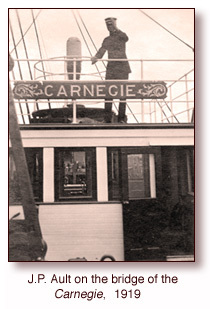 The Carnegie was a research vessel specifically designed and built for magnetic research. It was constructed of wood and non-ferrous metals so as not to affect the magnetic observations. Ault was a magnetic observer on Cruise I during 1909 and 1910. During 1911 he did office work at CIW in Washington and in 1912 he led a magnetic survey through Bolivia, Peru and Chile. In 1914 he was appointed Captain of the Carnegie for Cruise III, a position he would retain for Cruises IV, VI and VII. The Cruises of the Carnegie took Ault around the world several times, including a circumnavigation of Antarctica in 1915-1916 on Cruise IV. During the times between cruises he worked on reducing data collected on the cruises and various magnetic research topics for CIW. One exception to this was his work for the Army in 1918 on the aerial navigation of airplanes using compasses, sextants and astronomical observation. Ault and his wife had three daughters, Evelyn (b. 1912), Ruth (b. 1919) and Marjorie (b. 1923). Ruth died suddenly in 1920 from colitis. Ault was on Cruise VI of the Carnegie when Ruth died. The death had a great effect on Ault and nearly led him to resign. He was eventually convinced by his colleagues to continue the cruise. Ault's career was cut short during Cruise VII in 1929 due to an explosion during refueling of the Carnegie in Apia, Samoa. The entire ship burned and sank. Ault, and cabin boy Anthony Kolar, were the only fatalities. Click on a picture to see a larger photo open in a separate window.